Indigo here. How's it going? After the expository excesses of Part Three of The Long Road Home, I'm relieved that I can now post something short and simple. As are you, I'm sure. I'm delighted to report that one of my tales has found its way into print. 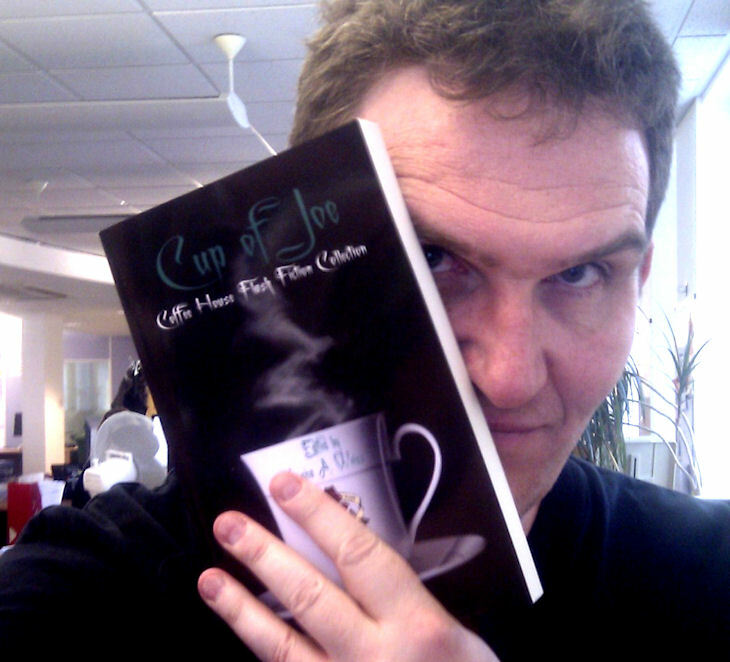 Yes, the Cup Of Joe Coffee House Flash Fiction Collection Vol 1 by Indie publisher Wicked East Press contains a tale by yours truly. It's a proper book, with pages, words, an ISBN number and a barcode. They even put my story near the end of the book. Top of the bill? Not quite, but damned close. Anyway, if you fancy owning a slice of publishing history - yes, I really do have big plans for a worldwide bestseller - go wander over and support all of the 100-odd writers that contributed to this excellent book. This includes my good friend Ms. Fin (hey Letisia!) whose piece is achingly elusive and beautiful. None of us will see a penny for our effort, but it's excellent exposure and a good-looking volume. And whether you like the book or not, you'll be doing us and other customers a great service by leaving a review. That is freaking amazing!! I am heading over there now! Congrats, Indigo!!! (And thank you for including me in your post!) So we won't be rich but, hey, we're in print! Yay! Well done. A fitting acolade to your talent and creativity. Your stuff is very easy to read and can absorb large amounts of time that should be rightfully employed elsewhere. I bet your contribution to the book will be a favourite of its readers. I just hope none of them snort hot coffee while they're reading! Hey Kato! Thank you, I'm pretty chuffed. I'll be sure to drop into Toronto when I'm on my world book signing tour. Hey Ms. Fin! My pleasure! And it's only fitting; had you not mentioned the anthology, I never would have submitted anything. So it's all your fault. Hey BoomBoom! Hang on, I'll join you! Yes, that's the stuff! Just you, me and Snoopy. Hey Eolist! Yes, you certainly did give me a hefty nudge. And I thank you for it. Oooh, do I get sparkles?! Hey Alistair! You're too kind, Sir. I just need to get another couple of hundred people to read my entries, and we might be onto something. I may even go viral, whatever that means. What, you don't leave the ISBN, so now I have to actually go type the title into a search. If I can even get it here. I don't know...okay, I guess I can figure out how to get a copy. Hey, Indigo! Congratulations and thanks for the note in your latest post because I had indeed missed this one. Now I know what to add to my pending Amazon order so I qualify for free shipping! Thank you Nancy. 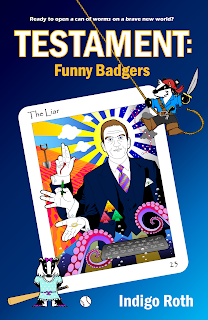 If you reread the entry, I've added a few more links for purchasing, including Barnes & Noble. By the way, I've finally decided today to create my first solo book, harvesting material from my first two years of blogging and transforming them into a broader narrative with an underlying plot. OH.MY.GOD! This is so awesome! I really need to pay closer attention. Now I can say, "I knew him when..."
CHRISSY - OH.MY.GOD! This is so awesome! I really need to pay closer attention. Now I can say, "I knew him when..."